Mayoral candidate Lori Lightfoot addresses the audience at the Kehrein Center for the Arts, 5608 W. Washington Blvd. The Ravinia Student Orchestra played two selections from “Hamilton” prior to the start of the event. Dorothy Tucker, CBS 2 Chicago reporter, a West Side native, was the moderator for the forum. The Ravinia Student Orchestra plays before hundreds of West Side residents. Lori Lightfoot looked on as she received a question from one of the forum’s panelists, Michael Romain, editor of Austin Weekly News. Lori Lightfoot waves at the audience before she takes her seat. Several audience members watch attentively as to what will happen next. Darnell Shields, executive director of Austin Coming Together, gave the evening’s final remarks. 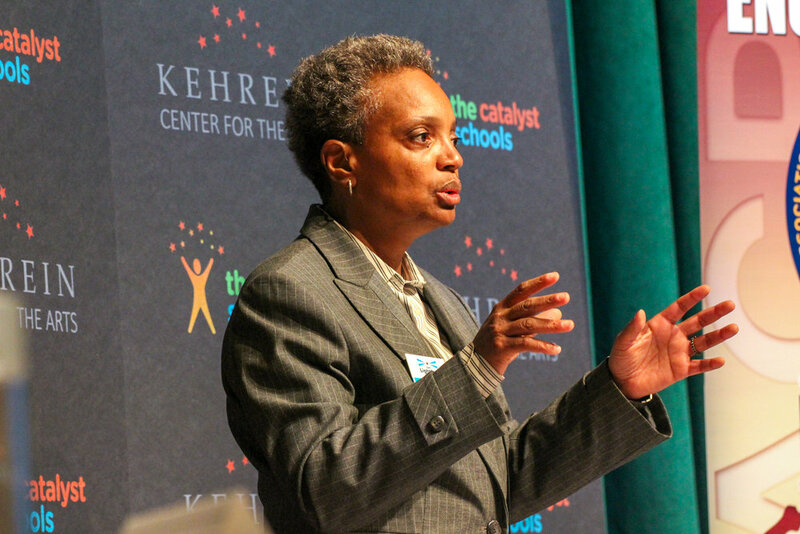 Several hundred community members gathered at the Kehrein Center for the Arts, 5608 W. Washington Blvd., for the West Side Mayoral Forum last Thursday night to hear from runoff mayoral candidates Lori Lightfoot and Toni Preckwinkle just five days before Election Day. On the night of the debate Chicago Tribune reporter Gregory Pratt noted on Twitter audience members became restless with what appeared to be extreme tardiness on Preckwinkle’s behalf after Lightfoot took her seat on stage. A representative from Preckwinkle’s campaign responded to Pratt by sharing a screenshot of an email sent to an event organizer only a few hours before that explained why the Cook County board president would not be in attendance. Forum moderator CBS 2 Chicago reporter Dorothy Tucker later voiced her displeasure over the timing of the response with a tweet of her own. With Preckwinkle absent Lightfoot, a former federal prosecutor, took questions from community leaders and residents on matters of police accountability, marijuana legalization, economic development and reinvestment on the West Side. Scroll through the photos above, and to read more on the forum, click here.